The dog flea is a species of flea that lives on the skin of a wide variety of animals, particularly the dogs and cats. It closely resembles the cat flea which can live on a wider range of animals and is generally more prevalent worldwide. The dog flea is troublesome because it can cause anaemia, skin allergy and tapeworms. Although they feed on the blood of dogs and cats, they sometimes feed on humans too. They can live without food for several months, but females must have a blood meal before they can produce eggs. They can lay about 1 egg per hour over their adult life time, which if left uncontrolled and in ideal conditions, could be between 2000 and 8000 eggs. The fleas go through four lifecycle stages: embryo, larva, pupa and adult. This whole lifecycle from egg to adult takes from two to three weeks, although this depends on the temperature. It may take longer in cool conditions. The flea mouthparts are adapted for piercing skin and sucking blood. 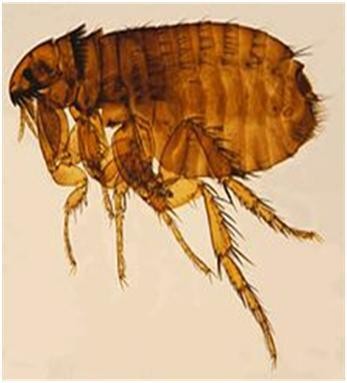 Fleas do not have wings and their hard bodies are compressed laterally and have hairs and spines, which makes it easy for them to travel through hair. They have relatively long hind legs for jumping. The dog often experiences severe itching in all areas where the fleas may reside. Flea allergy is developed by dogs becoming allergic to flea saliva. Preventing and controlling flea infestations is a multi-step process. Prevention in the case of flea infestations can sometimes be difficult, but is the most effective way to ensure the dog will not get re infected. Fleas also lay eggs in the dog’s environment. Therefore, effective prevention and control of flea infestations means removing the fleas from both indoor and outdoor environments and keeping immature forms of fleas from developing. Removing the fleas in indoor environments usually consists of removing them mechanically. Vacuuming can remove an estimated 50% of flea eggs. After vacuuming, using a specially designed product is recommended to kill the remaining fleas and to stop the development of eggs and larvae. Products available may include powders, sprays or foggers, which contain adult insecticides and insect growth regulators. Special attention should be paid to the dog's bedding. This should be washed every week; also the bed and surrounding areas should be treated with adult insecticides and insect growth regulators. Cleaning should be done at the same time in areas including, porches, patios, grassed areas, cars, garage, pet carrier, basement or any other place where the dog is known to spend time. Fleas can also be carried in by wildlife visiting the garden, such as hedgehogs, foxes etc. So try to discourage these wild animals and never leave food out for them. Removing fleas from the pets is not a difficult task considering the amount of products which are designed not only to kill fleas, but also to offer protection from further infestations. A very important part of flea prevention is to persist with the same control measures for as long as possible. Though the cleaning process was successful it can take up to 6 months to clear the fleas completely due to their four lifecycle stages. Flea-control products are available in once-a-month topicals, dog collars, sprays, dips, powders, shampoos, injections and oral products. All of these products contain an insecticide as an active ingredient which kills the fleas when coming into contact with them. Fleas absorb the insecticide which either paralyzes them or kills them. Different treatments are available for dogs from natural alternatives to chemical-based products that include topical medications and oral medications. Although common remedies provide natural options with natural ingredients which act as a repellent. Hi! We have tried frontline, advantix and other brand I can't remember. They are a bit itchy at first but seem to work. I also use a seresto collar, for further protection. we not only have fleas and ticks, we have leishmania mosquito too. Frontline got rid of mites I had, but it took a couple of bottles. I use frontline but vets have said there's lots of resistance to it...may have to try something else next summer as I've already managed to give a tick a free ride from Scotland too and it didn't seem to stop that even though it should have. I am using an expensive Advantage combo from the vets whilst travelling. Vet said marmite in food too but never heard that one before! We never had a problem with fleas until we moved to the middle of the woods. Our human tried everything including INDUSTRIAL strength spray and one of us lost nearly all her coat! We now only use Comfortis one tablet lasts a month quick easy and so much less stress. The tablets are wrapped in chicken so no hassle and these tablets started working within half an hour brilliant. We only use Frontline now with no probs or fleas. Used a cheaper own brand similar product & Star got fleas. Used Dorwest garlic spray on her to deter them & then used Frontline on her which did the job. Due to having an auto immune disorder, we don’t use chemicals.